Alcohol consumption in Ireland dropped dramatically last year because of the weak economy and cross-border sales in Northern Ireland, bringing average consumption levels in 2008 back to where they were a decade ago, an industry association said Monday. The volume of alcohol consumption declined by 6 percent in 2008, compared to an increase of 2.5 percent the previous year, according to a report released by the Drinks Industry Group of Ireland. The chairman of the industry group, Kieran Tobin, said that 2009 will be even worse if current trends continue. He projected that 10 percent of alcohol sales at shops this year will migrate to Northern Ireland, constituting a euro100 million ($135 million) loss in tax revenue for the state, as well as thousands of jobs - particularly in border regions. Irish shoppers have flocked to the British territory of Northern Ireland during the past year to capitalize on the strength of the euro, buying not just alcohol but other goods as well. Taking taxes into account, Irish shoppers can save about euro10 ($13.50) on a bottle of whiskey, Tobin said. 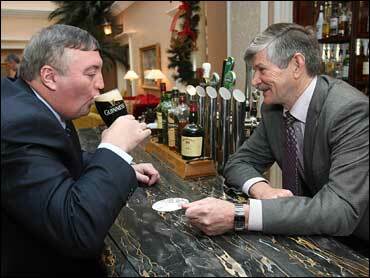 Up to 9,000 jobs will be lost in all sectors of the alcohol industry in 2009, Tobin said. The country has already seen the closure of an estimated 1,500 pubs in the past six years, according to the group. The performance of the alcohol market was worse in the second half of 2008 than in the first, and the year itself was the worst-performing in a quarter of a century. "Per adult consumption decreased by 7.3 per cent in 2008," said Dublin City University economist Anthony Foley, who compiled the report. "These rates are equal to the decline in consumption that was recorded in the entire seven-year period between 2001-2007. As a result average consumption levels are back to 1997-98 levels." Volume declined across all four alcohol categories, with the overall value of the market dropping 2.5 percent in 2008 to euro6.9 billion ($9.3 billion), Foley said. Cider decreased 11 percent, liquor decreased 7.7 percent, beer decreased 5 percent and wine decreased 4.1 percent. Tobin called on the government to take the report into consideration when announcing the supplementary budget next week and to forgo any increase in alcohol taxes. "The clear conclusion from this report is that all sectors of our industry manufacturers, distributors and retailers both in the on- and off-trade are under immense pressure and we call on the government not to add to this burden by considering any increases in alcohol taxes," Tobin said.